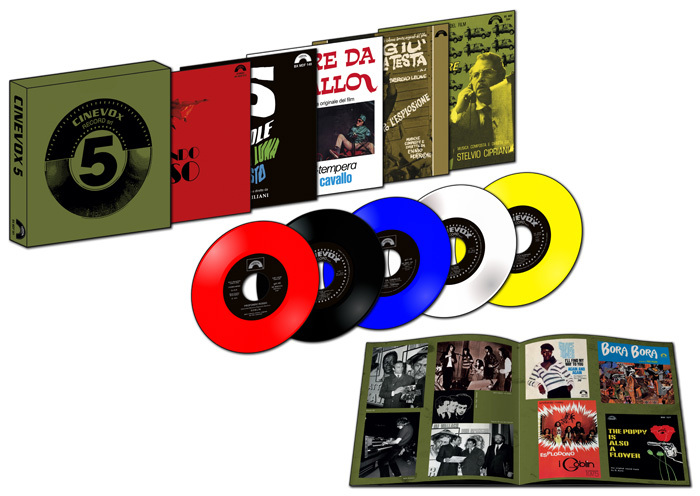 The box-set gathers the label’s five different shades, each of them here represented by a 45rpm from their most significant productions. Each 7” refers to a specific movie genre: western (Giù la testa), horror (Profondo Rosso), police/detective (La polizia sta a guardare), comedy (Febbre da cavallo) and thriller (5 bambole per la luna d’agosto). Tracklist and artwork faithfully reproduce the original ones, but the real deal for collectors is “5 bambole per la luna d’agosto”, which has never been released as a 45rpm until today, and features as a B-side an inedited song played by Balletto di Bronzo that hadn’t been included in the original soundtrack. – an ultra-limited crystal clear edition, available in only 100 copies.